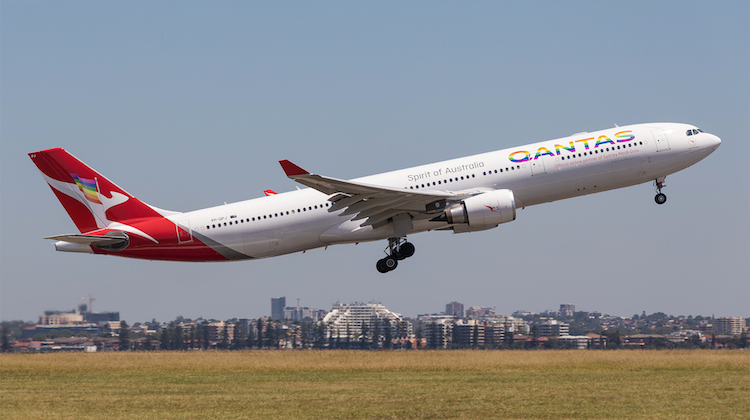 Qantas has added a touch of colour to one of its aircraft in a show of support for the the Sydney Gay and Lesbian Mardi Gras. Airbus A330-300 VH-QPJ features a rainbow flag alongside the Flying Kangaroo on the tail, while the airline’s name on the fuselage is in rainbow colours. The aircraft operated its first flights sporting the new look on Friday as QF433 from Sydney to Melbourne, and then QF37 from Melbourne to Singapore. It is unclear how the Flying Kangaroo on the tail is holding up the rainbow flag, given it lost it paws in the airline’s recent rebranding. The 39th Mardi Gras parade through the streets of Sydney takes place on Saturday March 4. 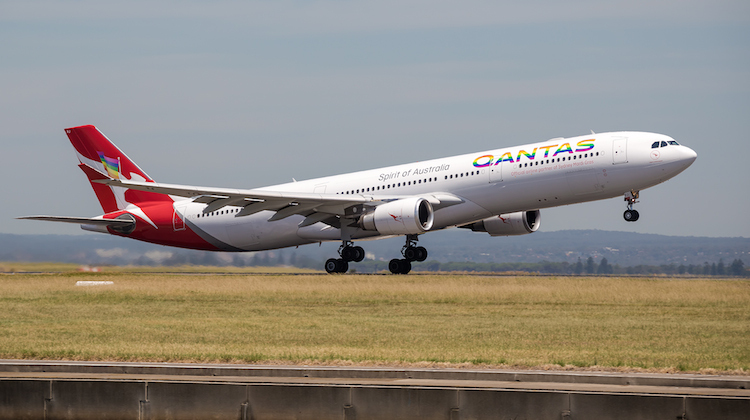 Since 2015, Qantas has had a float participate in the parade called the Gay380. A video from Qantas’s Facebook page shows the airline’s 2015 Mardi Gras Parade float. Great to see Qantas supporting the Gay and Lesbian Mardi Gras. On the logo — it’s a clear failure. Search any Qantas post that mentions #NewRoo and you’ll get at least 50% of comments in the negative. It’s not too late to acknowledge this brand failure and revert back to the elegant 2007 solution. The GAP did it in 2010 and that’s just one example of a brand that listens to its customers and puts customer comments and customer feedback ahead of the aspirations of its marketing manager or chief designer. Well done Qantas! It’s brilliant to see a company as diverse as Qantas leading the way to support equality and inclusiveness. Get people talking – very proud of our Flying Kangaroo! last comment still awaiting moderation – even though there have been 3 since I made it. could it be an alternative view to the status quo is not permitted on this website?? Love it!!!! Gay & fabulous babes! Happy MG’s!! This next batch interestingly includes 2 x Boeing 787s for El Al and a 5th Boeing 787 for Royal Brunei, so we might see more flights into Australia with this new equip,eat from RBA. Great work Qantas! What a great example of what can be done with the new livery. Nice paint scheme, but how’s the roo holding the flag with no paws? Peter – mate – its in the pouch. Maybe being held by a little Jetstar joey ?? What an outstanding achievement! I would not have thought it possible to make the new livery look worse but clearly I underestimate the ability of the marketing department. I don’t have a problem with Qantas supporting (a cynic might say patronising) the LGBTI community but you don’t mess with your brand to do so. Pathetic, give me a Virgin any day. I like the new ‘Roo! Now in the 21st Century! BTW, the end of the flag’s ‘pole’ is in the ‘Roo’s pouch! Well done, yet again, QANTAS! The new logo (no paws bat-thing) is a disgrace. What a shambles. Wonderful to see the airline supporting the Mardi Gras. I think the new Qantas logo looks clean, classy and modern, on this A330 and especially on the 787 (well, at least in the concept photo). Well done QANTAS! Sometimes it just takes a few weeks or months for people to warm up to a new design. I felt the same way (appalled) when VA changed its branding designs but now I find it appealing. Flag is upside down. International symbol for distress, or is it because we are down under?